Emerson’s placemat is finished and going in the mail tomorrow. Isn’t it cute? 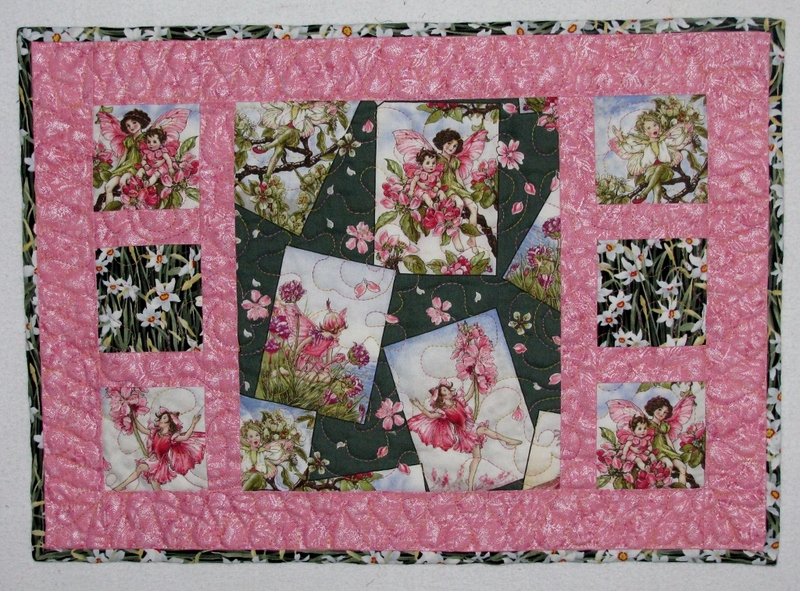 Pink is one of her favorite colors and I think that she will enjoy looking at the fairies. 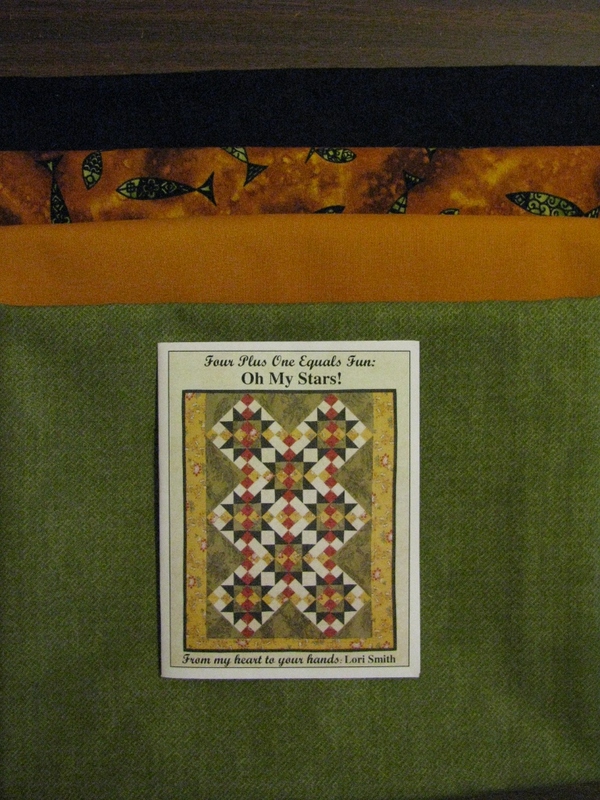 The placemat measures 21.75″ x 14.75″ and has 6,009 machine quilting stitches in it. This is the current project on my design wall. The pattern is Avignon Picnic Quilt by Andrea Harris. It can be found on the Moda Bake Shop website. Can you see a theme developing here? I didn’t plan this, but I am sewing outside of my usual color combinations. 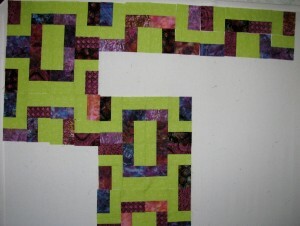 Green & pink, green & reddish purple, green & gold – these are unusual color choices for me, but I am enjoying the journey. 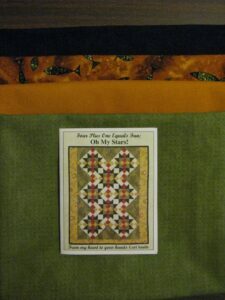 I have just returned from my first visit to the Black Canyon Quilt Show. I am headed back this afternoon to see our guest lecturer – Judy Martin. 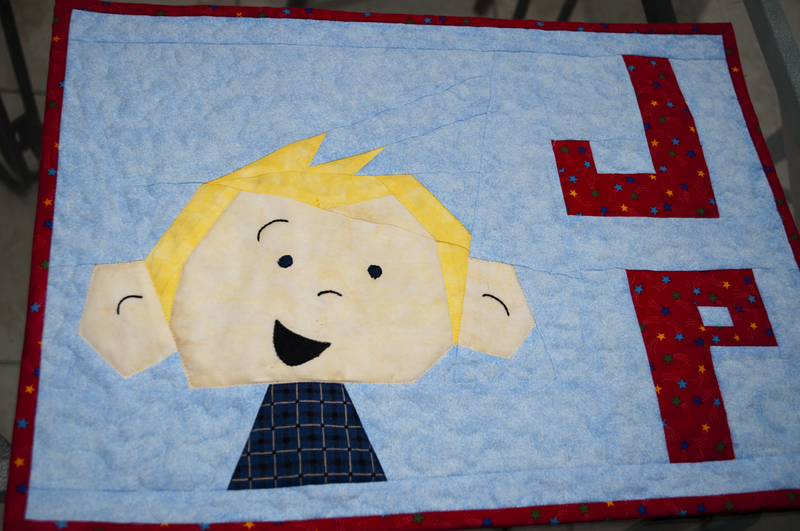 There are lots of wonderful quilts to see, but this post is about a funny. 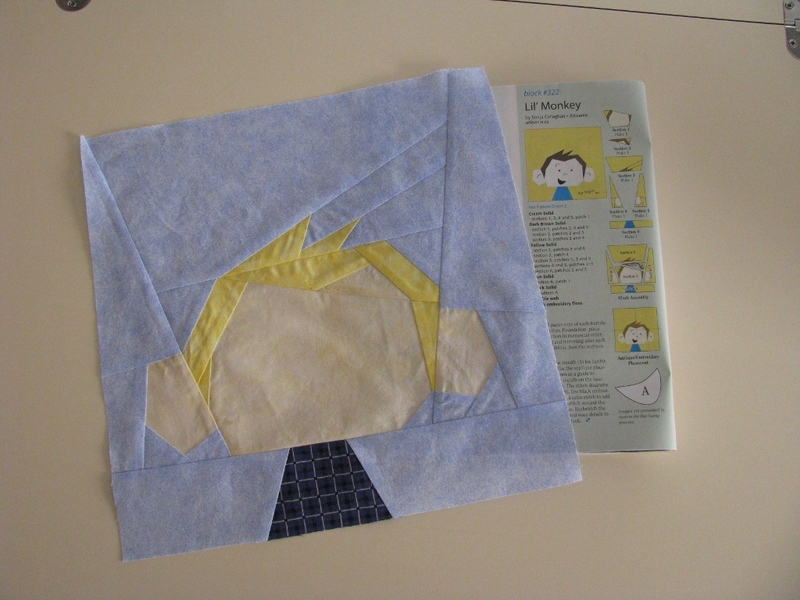 Do you remember the post about this project – the monster growth chart? I made this growth chart to be sold at the boutique with all proceeds benefiting a local charity. Well it has sold – as a table runner! Yes, you read correctly – the person who bought this plans to use it as a table runner. It just tickles my funny bone, but I am glad that the monsters have a good home. Off to lunch then Judy Martin. 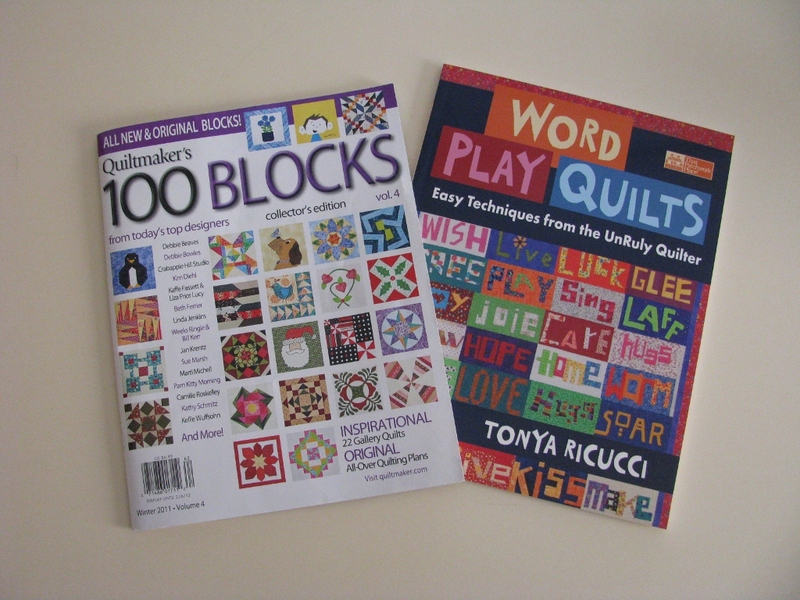 I have been teaching a Fun-n-Done class at the local quilt shop. 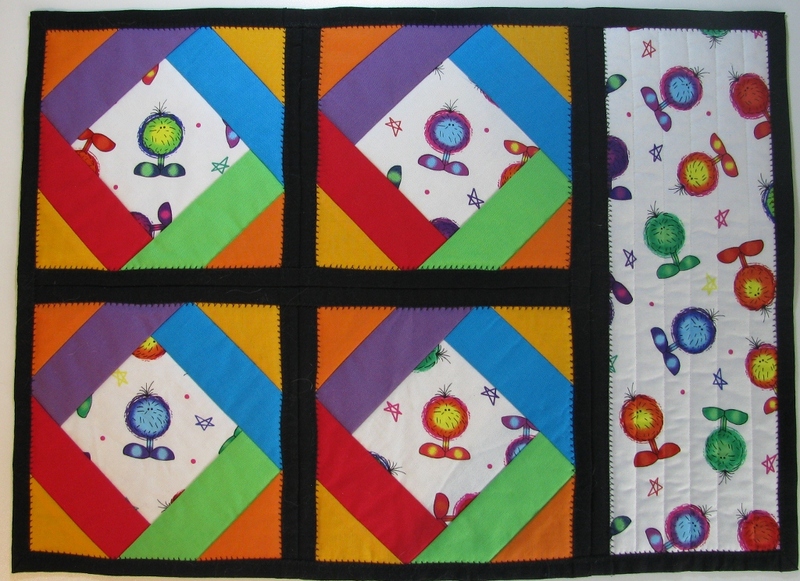 The Fun-n-Done patterns are a quilt-as-you-go or QAYG method. These class samples have been turned into a placemat since one of my grandsons – Alexander – is having a birthday in March. It is a surprise – so don’t tell him. He doesn’t read my blog, so it should be okay to post this picture. You may recognize the fabric from an earlier post. This was a perfect project to use up the leftover scraps from the growth chart. Now I need to box up his presents and get them in the mail. This is the third growth chart that I have made in the last five months. Two were birthday gifts for two of my granddaughters and this one is a donation. 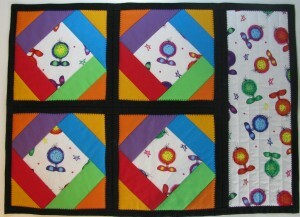 Every year the Black Canyon Quilt Show has a fund raiser for a local non-profit organization. This year the money raised will go to the Haven House which helps homeless families get their lives together again. I hope this growth chart sells well to help support such a worthy cause. Here is a close-up photograph showing the adorable puff monsters and the colorful tape measure (supplied by an eagle-eyed daughter at the cutting table at Jo-Ann’s) which adds the finishing touch. 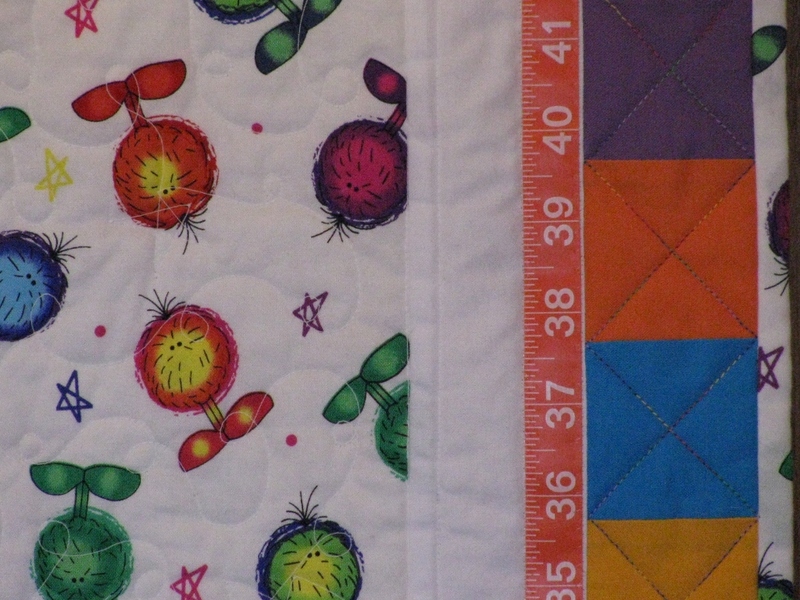 My quilting crystal ball tells me that there are more growth charts in my future. 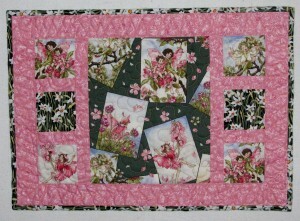 For now it is back to the 2012 Challenge Quilt. Here it is – the finished project. It was important to put his name on the placemat since he is learning to recognize his name. I enjoyed making this for JP and, as you can see, it looks just like him. I asked him who was on the placemat and he said “JP”. This is my favorite picture because it looks like JP and his cartoon reflection. You can follow the future adventures of JP and Emerson at Ten Shades of Silly. With the start of a new year, it seemed appropriate to stretch my wings and try something new – this blog. 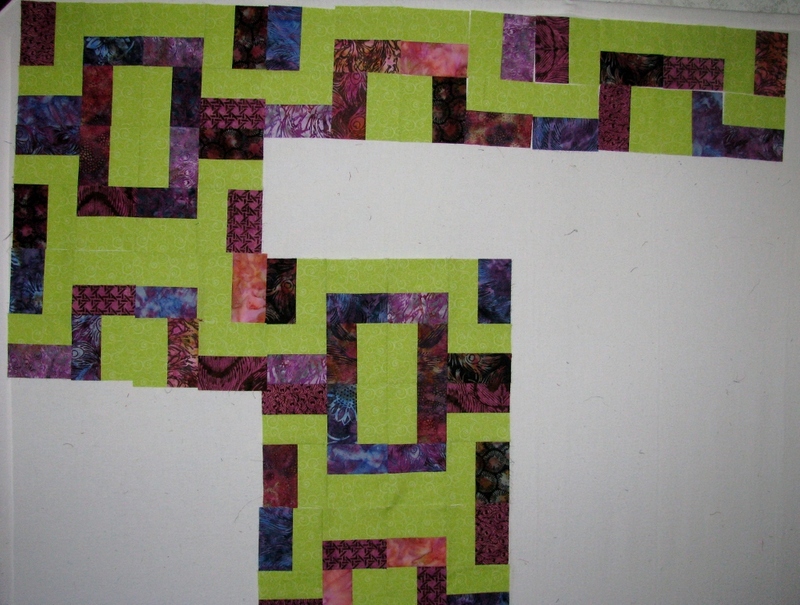 I am fairly organized so I have pictures of my finished quilts, but I wanted a record of the journey. So good or bad or wow or ho hum, this will be that record. I will be visiting one of my grandsons (age three) in a couple of weeks and he needs something special from Grandma. 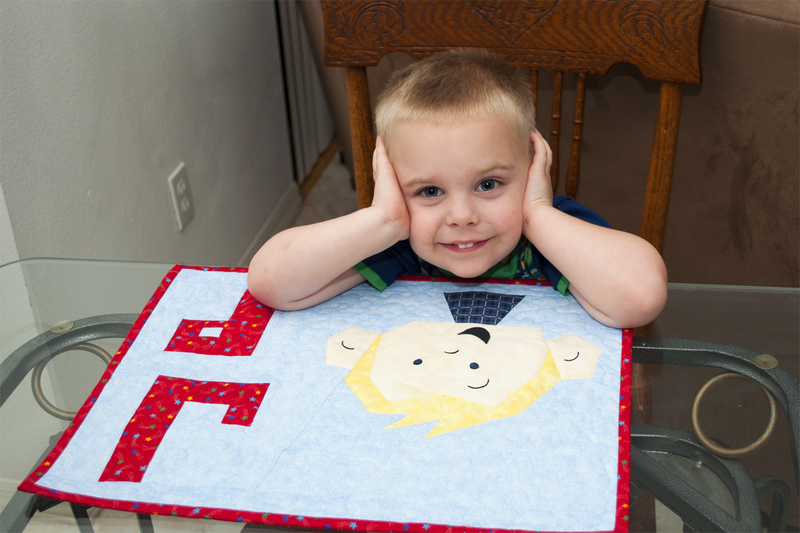 JP has blonde hair and blue eyes, so his placemat needed to match. I am hoping to get this finished in the next couple of days so that I can start something for his little sister.